But don't worry, GradeA provides detailed visual illustrations to make life a lot easier. In a nutshell, trig is a branch of mathematics that deeply analyzes the sides and angles of triangles. The 6 trigonometric functions are used to model the motion of waves, which have applications in many fields. Trig also serves as a foundation for much of calculus. Make sure you learn those trig functions! Law of Sines: Find missing sides and angles of AAS, ASA, and SSA triangles. Law of Cosines: Find missing sides and angles of SSS and SAS triangles. The Unit Circle: Used to quickly evaluate common angles of trig functions. Trigonometric Identities: Used to simplify equations involving trig functions. Trigonometric Table: A complete list evaluating angles from 1 to 360 degrees. Free Online Trig Calculator: Quickly evaluate trig functions with one click! Tangent: Learn a basic definition of the tangent line. 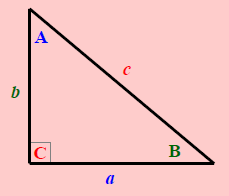 Trig is founded on the ratio of the sides of a right triangle. Basically, each function represents a fraction of one sided over another. The three basic trig functions are the Sine, Cosine, and Tangent, which are routinely shortened to sin, cos, and tan, respectively. Those three functions each have a reciprocal function known as the Cosecant, Secant, and Cotangent, which are also shortened: csc, sec, cot. The triangle's sides are given three special names according to their relation to the given angle. Understanding these names is critical to understanding the trig functions. The figure below shows the naming, as well as the definition of the six trig functions. Notice that the bottom row is the recpriocal of the top row. In many curricula trig is first introduced in geometry. Because of its connections to other formulas, you might want to look at this geometry formula sheet which also includes trig functions. Return from Trigonometry to the Homepage.